Past champions of the Virtual U.S. Open on WGT were immortalized today in New York City. Sarah Hirshland, Senior Managing Director of Business Affairs at the USGA, received the Virtual U.S. Open Champions trophy from Ed Willett, VP Sponsorships at WGT, in front of hundreds of people during the OnDeck sports marketing conference. There are two identical championship trophies, one at USGA Headquarters in Far Hills, NJ, and one at WGT headquarters in San Francisco, CA, both of which will be updated annually with the names of future champions. Each of these past champions will also receive personal trophies for their own homes, and players are being contacted this week by WGT for current mailing addresses. Log in and play WGT during the Ryder Cup and get a free Team USA or Team Europe virtual vapor golf ball each day Friday thru Sunday. 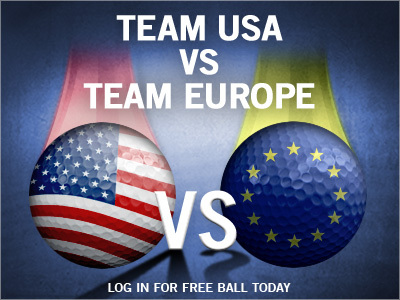 Watch the top players from the USA and Europe compete, and support your country with either the Team USA or Team Europe golf balls. These special edition virtual golf balls give you additional distance, spin and a vapor trail for better visibility. Log in every day and get 3 free balls! *Special offer for WGT players who log in Fri-Sun 9/26-9/28, get 1 free Team USA (if in the US) or Team Europe (if not in the US) virtual golf ball each day. Sherbrooke Country Club is currently ranked #2 on the Weekly Leaderboard, with almost 350,000 Weekly XP. As an active club with 250 members, they have consistently been a top-ranking club on the Leaderboard and are currently at Club Level 8. At Level 8, they have unlocked a number of country club benefits, including a free Putter Pal and Shot Pal for all of their members, earning +5% Club XP when members play using a Pass and now a player XP Bonus of +3% per round, when using a Pass. Keep leveling up your club to unlock these benefits too! Members of the SCC are very faithful, ethical and very active, we currently have 18 Tour Legends and over 100 Legends with the majority of them started as Pros in our CC. That is why, even today, we welcome players of all levels and they have the opportunity to receive the expertise, tips and tricks of our most experienced members. The total number of stroke play rounds played by our members is over 239,000, which represents more than 950 rounds per player, and that's not counting the countless rounds in Alternate, played for fun between players of the CC. Started as a zero, we made a lot of progress over the years and we gain maturity, but more important, it is all the friends we have made over the years and that is priceless." The current Weekly Leaderboard below shows the Sherbrooke Country Club in second place -- just behind The Peoples Club at #1 and just ahead of the Senior Citizens, The old duffers retreat and AUGUSTA NATIONAL CC. Be sure to post your Round 1 score in the Strike Out ALS Challenge by Thursday, 9/25. This month's tournament is a Major on the WGT Virtual Tour, with a total purse of 400,000 WGT Credits up for grabs. Play as many times as you want to post your Round 1 score by 9/25 to qualify for the single-play Round 2 9/26-9/30, both on Merion. Plus, you get a free ALS Association virtual golf ball when you enter, and you'll help create more awareness to cure this disease. Major tournaments like this have a huge purse of 400,000 WGT Credits. These credits are added to your ongoing Virtual Tour season earnings to help qualify you for the Virtual Tour Championship in December with a record purse of 1,000,000 WGT Credits. This week's Country Club of the Week is... The WGT Alien Ambassadors, led by well-known WGT player, YancyCan. Currently at Club Level 3 with more than 82,000 XP earned, all 22 members of The WGT Alien Ambassadors have the "wgt.com golf is FUN" attitude. Many of you may know club owner YancyCan from his YouTube channel, or his various in-game investigations on the WGT Forum (like the "Bethpage Black Squatch Hunt" and the more recent "Pinehurst Easter Egg Hunt"). "The WGTAA Country Club was founded for those individuals who believe in the "Yancy Hypothesis" which declares that Aliens from other galaxies are colonizing the Earth via golf courses. Our members will serve as ambassadors from WGT.com & Earth when 'first contact' with the Aliens occurs. The WGTAA CC is not the most socially active club all up on the WGT and our member count is small compared to others. We think this shows that WGT Country Clubs do not all have to have 300+ members to be a great club. The running joke is that we tell new recruits that when they are on the WGTAA CC page: 'Shhhhhh be very quiet as likely we are napping.' If you are intrigued, we are currently accepting new members." The current Weekly Leaderboard below shows The Peoples Club at #1, followed by the Sherbrooke Country Club, The old duffers retreat, the Senior Citizens and IBIS GC. Get 2 free Country Club Passes on WGT this weekend. Use your Country Club Passes to earn XP for your club to unlock free stuff for all members, like a free Putter Pal at Club Level 2. Log in to WGT Sat-Sun 9/13-14 on Desktop (not Mobile) and get 2 extra Country Club Passes. Not in a WGT Country Club yet? Visit the Country Clubs page to join an existing club, or create your own! Which course are you playing this weekend on WGT Golf Mobile? ...and 12 other famous golf courses, all free on WGT Golf Mobile on your iPhone or iPad. This week's Country Club of the Week is... UK Golfers Elite, a smaller yet very active club focused on having fun and embracing what they have. We highlighted UK Golfers Elite when we first launched new WGT Country Club features, when they were at Club Level 3. We had a chance to talk to them and wanted to share their progress and comments. Currently at #12 on the Weekly Leaderboard with more than 152,000 Weekly XP earned, this country club has 95 members and has already reached Club Level 7. 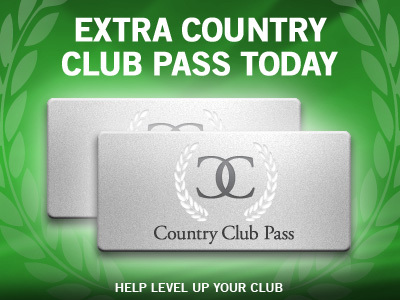 They have unlocked a number of country club benefits, including a free Putter Pal and Shot Pal for all of their members, and earning +5% Club XP when members play using a Pass. When they reach Level 8, the club will unlock an XP Bonus of +3% per round, when using a Pass. Keep leveling up your club to unlock these benefits too! "UKGE is very much a team effort with the CC now controlled by a group of guys affectionately known as the Fixers who work on putting together a schedule of events to hopefully cater for all types of players. We have a full schedule of events running from June to June that feature 5 weekly free events, 3 weekly credit events, 4 12 round Seasonal leagues with tier specific prizes, 6 x 72 major strokeplay events, One on One style single and Pairs leagues, Team events including a Ryder and Walker Cup at the end of the season and we have a Season Long Order of Merit with points collected from the weekly CC events. There is a regular Friday and Saturday Night Beer Club to complement our closed group Facebook Group known as the 19th hole. The CC has a Chairman (DJW2307) aka Fixer 2 who develops strategy and tournament set up, and is greatly assisted by stevepsheehan (Fixer 9) who heads up our Recruitment and Induction programme, as well as onekeano (Fixer 7) and SteveW65 (Fixer 8) who work on Tournament set up as well. liam91 (Fixer 5) coordinates an ever growing variety of CC v CC events and we have fantastic support from the CC members." The current Weekly Leaderboard below shows The Peoples Club at the top, joined by the Senior Citizens, The old duffers retreat, Sherbrooke Country Club and IBIS GC at Club Level 8. The #IceBucketChallenge from Facebook and Twitter has reached WGT, with the Strike Out ALS Challenge as this month's Major tournament on the WGT Virtual Tour. Play as often as you want to post your best Round 1 score by 9/25 to qualify for the single-play Round 2 9/26-9/30, both on Merion, host of the 2013 U.S. Open. WGT is very proud to be working with the ALS Association to support the fight against ALS to treat and cure this disease. 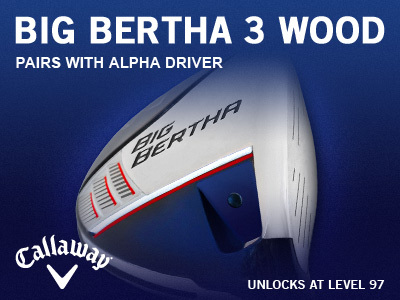 The new high-level Big Bertha 3 Wood from Callaway is now available for top WGT players. This Bertha 3 Wood hits for over 250 yards on WGT and unlocks at Level 97, designed to pair with both the Bertha drivers at Levels 88 and 96. Reach more par fives in two shots for more eagle putts!